When we drive, we rely on our speedometer to tell us how fast our car is moving. A speedometer helps us to stay within the speed limit and drive at an appropriate speed. However, speedometers aren’t always accurate. If you suspect that your speedometer isn’t providing correct readings, we’ll be able to use a speedometer calibration tool to test and adjust your vehicle. The speedometer calibration in many cars is determined by the ratio of the vehicle’s tires and transmission. Typically, a speedometer manufacturer will look at these factors and work to ensure that the speed readings that a speedometer is providing are accurate. However, people that are using cars that have been customized in some way may not be receiving the right reading from their speedometer. We can test the speedometer on your vehicle with a speedometer recalibration device. We’ll be able to use the readings to adjust the ratio with adapters so that your speedometer provides completely accurate speed readings. Driving with an inaccurate speedometer can cause you to be ticketed, and it can put you in danger. If you suspect that your speedometer is no longer accurate, you’ll want to have it tested as soon as possible. Proper speedometer calibration can be attained with the aid of an adapter. However, the best way to test your vehicle will vary based on the way your speedometer is calibrated. If your speedometer uses gears and worms inside the head that gauge your speed, a mechanical adapter will be the best way to test and adjust your speedometer. When we test your speedometer, we’ll be able to determine whether or not any errors are coming from the head of your speedometer. This will allow adjustments with a high level of precision. In some cases, you may have issues with your cable delivery rather than your speedometer head. It’s important to determine the source of the problem to fix it properly. We’ll use special tools and thoroughly test your speedometer so that we can decide what the right course of action is. When we test your speedometer, we’ll take a look at the gear ratios of your vehicle. If necessary, we’ll change the gear ratios of your speedometer so that it no longer provides inaccurate readings. We can also analyze the gear ratios of your odometer. If you’ve altered your vehicle, your odometer may not be displaying the accurate mileage of your car. We have the parts necessary to modify speedometer and odometer ratios. We’ll be able to evaluate your vehicle and determine the best way to correct your gear ratios. Because we’ll be able to gather in-depth information about the readings that your speedometer and odometer are providing, we’ll be able to see if your gear ratios have to be adjusted. If you’ve changed the transmission in your vehicle, it’s possible that it’s no longer compatible with the speedometer in your vehicle. For example, if you have a cable-driven speedometer, but have replaced your original transmission with an electronic one, it will be impossible for your car to gauge speed accurately. Thankfully, there’s a simple and effective solution to this problem. We can install an adapter in your vehicle that will help your speedometer to correctly measure the signals that are coming from your electronic transmission. Without an adapter, you could wind up damaging your speedometer’s needle. If you’ve swapped out your transmission, you’ll want to have an adapter installed in your vehicle as soon as possible. Acting quickly will help you to avoid future problems. 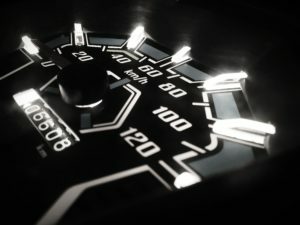 In addition to adjusting the ratio of your speedometer, we can repair or restore it as needed. Many classic cars have speedometers that are quite old. Vehicles have been using speedometers since the late 1800s. Even some of the oldest speedometers can be restored so that they provide accurate readings again and look like they did when they were originally installed. We’ll be able to evaluate your speedometer to determine what sort of repair or restoration work it needs. We can repair speedometers from a number of brands, and we can make an old speedometer look like it’s brand new. If your vehicle has been modified in some way, then there’s a good chance that the readings you’re receiving from your speedometer are no longer correct. We can test your vehicle so that your speedometer can be adjusted. Make sure that you know at what speed you’re driving. Have us check your speedometer with a speedometer adapter. We’ll provide you with accurate information and make the repairs that you need. We have literally decades in the industry and are more than happy to help you troubleshoot common problems, offer speedometer calibration, and many other gauge related services. We provide unbeatable turnaround – typically in 24 hours or less.